After a lot of trouble, I’m really happy that I was able to build an async I/O implementation of my protocol. However, for real code, I think that I would probably recommend using with the sync API instead, since at least that is straightforward and doesn’t incur so much overhead at development time. The async stuff is still very much a “use at your own risk” kind of deal from my perspective. And I can’t imagine trying to use it in a large project and no suffering from the complexity. It doesn’t seem to be doing much, right? And it is clear what the intent of the code is. Now, it took me a long while to figure out what is going on. The issue is that the code I’m seeing isn’t the actual code, because of macro expansions. We use the ? 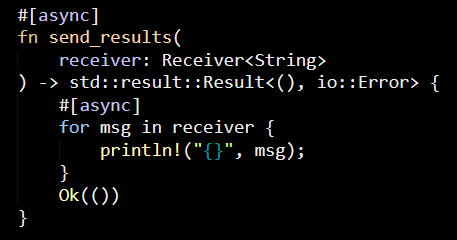 to return early from the poll method, and the Receiver I’m using in this case is defined to have a Result<String, ()>, so this is the cause of the problem. I returned my own error type as a result, giving me the ability to convert from (), but that was a really hard thing to resolve. It might be better to have Rust also offer to show the error on the expanded code by default, because it was somewhat of a chore to actually get to this. What made this oh so confusing is that I had the exact same code, but using a Stream<String, io:Error> that worked, obviously. But it was decidedly non obvious to see what was the difference between two identical pieces of code.